Delicate white paper with a semi-translucent quality becomes something special when printed with your design. Tissue paper is the final layer between your client and your product, and sets the expectation high for what will be revealed underneath. We offer gorgeous premium colours for your design such as Metallic Gold and Silver to give a regal feel to your tissue paper. Packaging need not be boring or plain - custom printed tissue paper is one of the most delicate and detailed options you can find. Combine printed tissue paper with custom printed wrapping paper from Jukebox to complete the look. Designed by Edeline & Bo. We offer gorgeous premium colours for your design such as Metallic Gold and Silver to give a luxurious feel to your tissue paper. Can I order tissue paper in less than 1,000 per set? See: What does 'sets' mean? At this time, the minimum quantity to order for our tissue paper is 1,000 qty per set. We print this product with offset output and your choice of one or two Pantone coated colors (one side only). Tissue Paper can be ordered at a minimum quantity of 1,000 sheets. Compare the 2 types we have available to see which one suits your brand best. 9" x 12", 13" x 19", 19" x 29"
Large patches of solid coverage (approx. 2" x 2") will not dry as well and may smudge. Tips Choose this type for the most design and colour flexibility, and maximum ink coverage. The waxy nature of this style adds an instant premium touch. Choose this as an upgrade to the standard! *All prices are based on 50% ink coverage. If your design requires more than 50% ink coverage, please submit a Custom Print Quote request to receive the additional cost. **Since 1pt Black tissue paper is a dark stock and our white ink is not opaque, white ink will appear more grey than a true white on this stock. For guidance on design or file preparation, see Tissue Paper Design Guidelines and Considerations and Registered Tissue Paper. If you require a custom trim size, or wish to order tissue paper with more than two colours, this can be requested via a Custom Print Quote. If you would like samples of our tissue papers, you can order and request this as part of a Specialty Sample Pack. Custom printed Tissue Paper is a beautiful packaging option to complete the looks for your products or gift bags. include registration of the two colors; however, you can submit a Custom Print Quote request if you require a registered design. Our Estimations team will let you know about the additional costs. A design will be considered registered if the two colors are closer than 0.125" together. A design will be considered non-registered if the two colors are 0.125" or further away from each other. Our Tissue Paper product is available with one or two Pantone coated colors on one side as a regular order. This pricing does not include registration of the two colors; however, you can submit a Custom Print Quote request if you require a registered design. Our Estimations team will let you know about the additional costs. 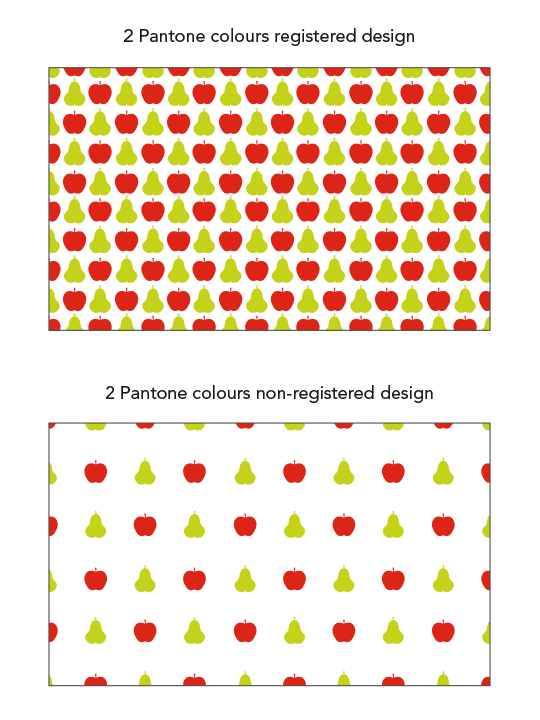 Can you print a full coverage design instead of a repeated logo or pattern? How long does Tissue Paper take to produce? products which have a turnaround time of approximately 2-3 business days. Our Tissue Papers take approximately 8-10 business days to produce and production begins after the approval of an online PDF proof. We do not offer a rush service on this product at this time. If you need packaging material with a fast turnaround time, you may consider our Wrapping Paper products which have a turnaround time of approximately 2-3 business days. How many colors can I have in my design? You can select up to two colors (one side only) for your Tissue Paper order. If you would like additional colors, please submit a Request a Quote for custom pricing. Can I print my design in a metallic color? We use Pantone coated inks to print on our Tissue Papers, which gives you the option for metallic gold or metallic silver. If I choose white ink, will my design be visible? Choosing white ink provides a much more subtle visual effect on our 1pt White Standard Tissue Paper and 1pt White Wax Tissue Paper. The printed areas will appear more opaque and this will provide some contrast against the translucent tissue paper. Large and bold images are recommended when using white or any light colors on white tissue paper as anything otherwise may be difficult to read. Can I print a photograph? A photographic image will not be suitable for this product. We require simple artwork with no gradients (vector based preferred). See Tissue Paper Design Guidelines and Considerations and Registered Tissue Paper for more information. How much of the tissue paper can I fill with my design? Due to the translucent quality of the tissue paper, we do not accept a flood of color or high ink coverage (e.g. full color background). Only repeated patterns will work well. Can I print a different design on each sheet? Dynamic printing (printing variable images on each sheet) is currently not available with this product. The same design will need to be used for the full quantity that is ordered. How long does it take? Can I get it rushed? This product takes approximately 8-10 business days to produce from proof approval. A rush service is currently not available. Like most tissue paper products, this is a very delicate and thin paper. If you are looking for a more durable / sturdy packaging option, check out our Wrapping Paper products instead. Samples may be requested as part of a Specialty Sample Pack order. See: Tissue Paper Design Guidelines and Considerations . What colors can I choose for a Tissue Paper design? Pantone coated colors for your artwork on Tissue Paper. Classic combinations are metallic gold and silver, or white with a metallic color for a more subtle effect. Neon colors are available by custom request only and will have an additional cost. Please submit a Print Quote request if you are interested in ordering Tissue Paper with a Neon color. 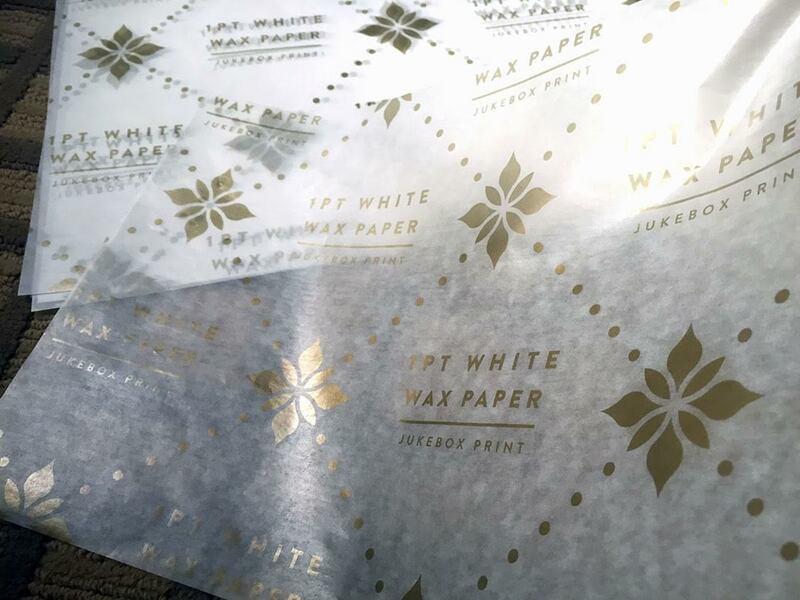 1pt White Wax Tissue Paper with Metallic Gold ink. You can choose one or two Pantone coated colors for your artwork on Tissue Paper. What is the difference between Tissue Paper and Wrapping Paper? Tissue Paper is a delicate material that is slightly translucent and extremely pliable. We offer 2 types of Tissue Paper in a variety of sizes: 1pt White Standard and 1pt White Wax. We print this product with offset output and with up to 2 Pantone coated colors (one side only). Tissue Paper can be ordered at a minimum quantity of 1,000 sheets. See Tissue Paper Comparison for more information. Wrapping Paper is made out of stronger recycled Kraft paper, available in a variety of shades from white to brown and thicknesses from 3pt to 8pt. It offers more protection and is less pliable than Tissue Paper, especially in the thicker options. Wrapping Paper is ordered by individual roll (24" wide), with varying lengths available up to 450'. This product is available with black ink only or full color CMYK, but with exceptions. Please review our Wrapping Paper FAQs for more information. Both of these Jukebox products are great packaging options that let you have your own custom design or logo printed on the paper. Can I get samples of Tissue Paper? order. If you are local to one of our offices, you are more than welcome to stop by to pick up a sample instead. Please note all tissue paper samples are cut down to a smaller size to fit in our sample packs. Tissue Paper samples can be requested as part of a Specialty Sample Pack order. If you are local to one of our offices, you are more than welcome to stop by to pick up a sample instead. We recommend a pattern (repeatable design) due to the increased probability of shift and tilt that is inherent in the product. Small Logos or Patterns Your logo or pattern must be submitted in a 5" x 5" PDF file (preferred file format) where the image is centered on the page or the pattern is designed to be seamless all around (when repeated throughout the tissue paper). Keep in mind that a member from our Prepress department will tile your artwork as part of the proofing process, so ensure your file is set up correctly before ordering. Large Images or Illustrations If your image or illustration is larger than 5" x 5", you must supply your file in the actual size you are ordering, with the addition of 0.5” bleed on all four sides. The finest detail we recommend is 0.25pt line-weight; however, please note that light colors or lines that are not solid (such as dotted lines) should be made thicker. Due to the unique nature of this product, shifting and tilting may occur, causing the position of the artwork on the final product to differ from what is seen in your proof. All artwork must be submitted in the Pantone coated color(s) you want to use for your design. If no Pantone color is defined, we will print the tissue paper with Pantone Neutral Black C.
Almost any Pantone coated color is acceptable for Tissue Paper; however, neon colors will need to be requested as a custom order by submitting a Custom Print Quote form. Due to the translucent quality of the paper, you can only print a design on one side. Darker colors will be more easily seen through the back side of the paper. Additionally, a flood of color or high ink coverage is not acceptable. Only repeated patterns will work well. It is highly recommended that your design is provided in vector format; however, high resolution raster files can also be accepted. Regular orders placed for 2 color designs will not include registration. This means there needs to be at least 0.125" space between the different colors. Registered designs can be requested through a Custom Quotation form for an additional cost. See Registered Tissue Paper for further information. Bleed is the artwork that extends past the trim line or finished size of your product. If any element of your artwork is designed to be printed to the edge, it must be extended past the trim line and into the bleed area by a minimum of 0.5". The addition of bleed compensates for uncontrollable shifts that occur during the printing and trimming process; and ensures that any content touching the edges does not leave unwanted gaps or borders. See: What is bleed?